Opening Times: Club times Tue 1800-2030, Thu (summer only) 1800-2030. No public times. Charges: No daily individual charges. Clubs pay to hire the track and are reimbursed by their members. The official opening meeting of the original cinder track which was 6 lanes all round with a 7 lane straight was the South West Inter Counties Schools Championships held on 29th June 1957. However the track was in use a bit before as the Cornwall County Schools Championships took place here on 15th June 1957. 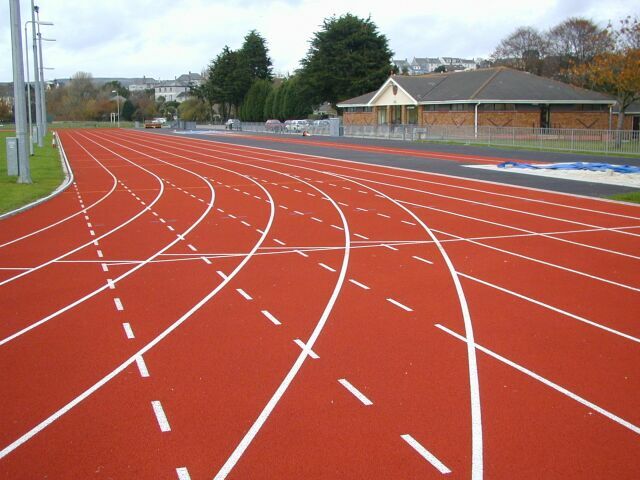 The track was upgraded to synthetic in 2000 with the help of a Lottery Sports Award and was built by G Thornton (Contracts) Ltd. and has a Polymeric surface. The first meeting to be held on it was the Cornwall Junior Schools Championships on 28th June 2000. The official opening was on 23rd July when there also a Cornwall League meeting. The synthetic track is still 6 lanes but with an 8 lane straight and the home straight is on the opposite side to where it was on the cinder track so sprint races will have the prevailing wind behind. The horizontal jumps area has also been moved so that it is now in front of the pavilion. Proper floodlights have been installed although they are not of full competition standard. The new perimeter fence is fairly low at about 1.2m.